YoYo lives in the Crenshaw, California home that her grandmother first bought over 80 years ago. Over the years, both her mother and grandmother made some major renovations to the home, but nearly all of them without professional help. Note: This article originally appeared in the July 2016 print edition of the Larchmont Chronicle. A pedestal sink is a classic piece of bathroom furniture that can act as a centerpiece for bathrooms of various sizes and styles. For this week’s Transformation Tuesday, we’re looking at a traditional style bathroom we remodeled in the Los Angeles area. 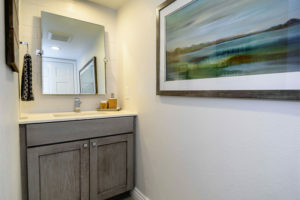 The homeowner wanted to switch from a beachy style bathroom to a more traditional style room that incorporated natural stone and classic-looking furniture and fixtures. A large two-sink vanity with an expansive countertop and vast storage doesn’t work for every remodel. 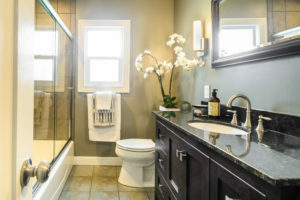 For certain homes, we approach guest bathrooms and small washrooms with a minimalistic approach, finding a small vanity to make a big impact, focusing on functionality and style over size and stature. For this week’s Transformation Tuesday we’re taking a look at this traditional bathroom we installed in a Los Angeles home. 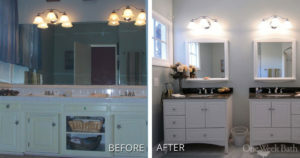 This homeowner was in a similar situation to many of our clients; after living with a tragically outdated bathroom for many years, she finally had the means and time to invest in a remodel. 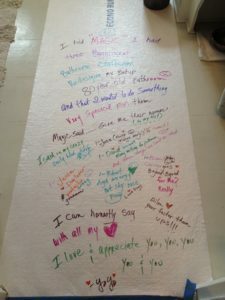 Last week we shared a story with you about a special client named YoYo who wrote a clever note for our team. 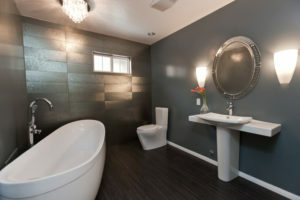 Elegant, serene, luxurious: these are a few ways to describe freestanding tubs. 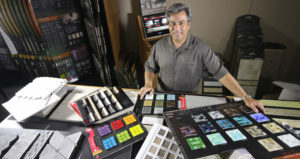 They’ve made a big comeback during the past few years, and they make for a great focal point in large bathrooms. For this Transformation Tuesday, we’re taking a look at a vintage-style bathroom remodel on the top level of a Los Angeles home. A little known fact about One Week Bath founder, Matt Plaskoff, is that he used to play in a basketball camp.